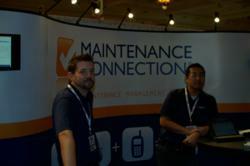 Maintenance Connection, a leading provider of browser-based Enterprise Maintenance Management Solutions, recently returned from exhibiting at the 2011 Facility Decisions Conference and Expo. The event was held October 11-12, 2011 at the Mirage Convention Center in Las Vegas, Nevada. This was a highly attended event for all facility professionals. A large exhibitor area was provided where Maintenance Connection was on display, and representatives were available for questions. Facility Decisions is a trade show and educational conference for facility professionals responsible for the management, operations, maintenance, renovation and construction of non-residential buildings. More than Seventy-Five free educational sessions were divided into eight unique tracks, each focusing on a specific aspect of the facilities management department. These sessions are typically led by the industry's biggest, most-respected experts, some of which are or have been Maintenance Connection users. Maintenance Connection provides a version of their CMMS that is custom tailored to meet the specific needs of the facility management organization. Whether it’s Preventive Maintenance, Corrective Work Orders, Asset Downtime tracking, or Asset work history; Maintenance Connection handles asset management to the fullest potential. You can next catch Maintenance Connection exhibiting at Reliabilityweb’s IMC-2011 – The 26th International Maintenance Conference, in Bonita Springs, Florida, December 5-8 2011.